Flash deals with everything he’s lost as he goes head to head with Reverse-Flash. Every superhero has a moment that defined them or shaped them in a significant way. And while the Batmans and Supermans of the world never got to battle theirs head on, The Flash has his mother’s killer still running and looking just like him. However, while “The Man in the Yellow Suit” plays with some high concept schemes and bombastic superhero battles, the real focus is not on Barry fighting Reverse-Flash. It is on the implications of what happens when something so monumental to you reappears. This episode picks up at Christmas time in Central City, but the holiday cheer is put on hold as the team discovers that a red blur has been running around stealing from a tech company. With witnesses describing exactly what Barry saw the night of his mother’s murder, Flash became determined to find the speedster at all costs. It was Barry’s relationship to Reverse-Flash that formed the crux of the episode, allowing Mr. Allen to have an emotional journey without revealing everything about this season’s big bad. Berating those around him for not throwing themselves into the mystery as he was, Barry’s personal struggle made this one of the more serious outings for The Flash. However, given the circumstances, it seemed appropriate. There was tons of great material for Grant Gustin here, from his heart-to-heart with Joe to another visit with his dad. Joe’s speech about how Barry managed to stay upbeat despite all the tragedy in his life was a memorable one; his journey to stop allowing Reverse-Flash to mess with his head was one of the show’s finest moments. That wasn’t the only bright point, however. We also got some movement on the Eddie/Iris front, with the two moving in together and Barry still struggling with his feelings for her. Luckily, the writers seem to have cashed their chips on this particular storyline as Barry finally admitted his feelings for Iris in that saccharine Christmas sort of way. 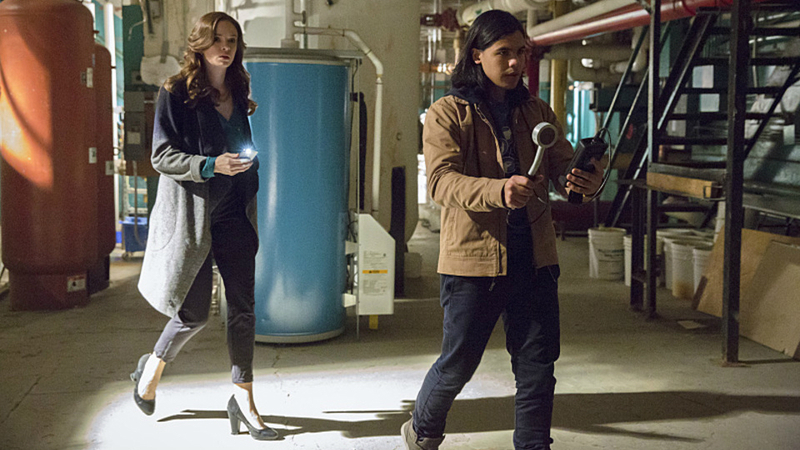 Also intriguing was Caitlin and Cisco going on their own little journey to confront the much hyped Robbie Raymond, aka Firestorm. He has been appearing sporadically around town without memories or the ability to stop randomly shooting fire from his hands. “The Man in the Yellow Suit” was one of the finest episodes of The Flash yet, offering an emotionally engaging story for Barry while driving the Reverse-Flash plot forward in a major way. While it would have been nice to see a bit more of Firestorm, the reveal of Reverse-Flash was full of great material. It was overall a great episode to leave as the show enters it’s winter break, with Firestorm in play, and the show going as far as to tease the existance of time travel. There’s going to be alot of great stuff to explore come January. And how cool was that end tag? Dr. Wells certainly has fine taste in rings. What do you think of Reverse-Flash? Are you excited to see more Firestorm? Use the speed force to leave your comments in the area below.